A British soldier's fascinating photographs showing the devastation across Nazi Germany immediately after the Second World War have come to light 70 years later. 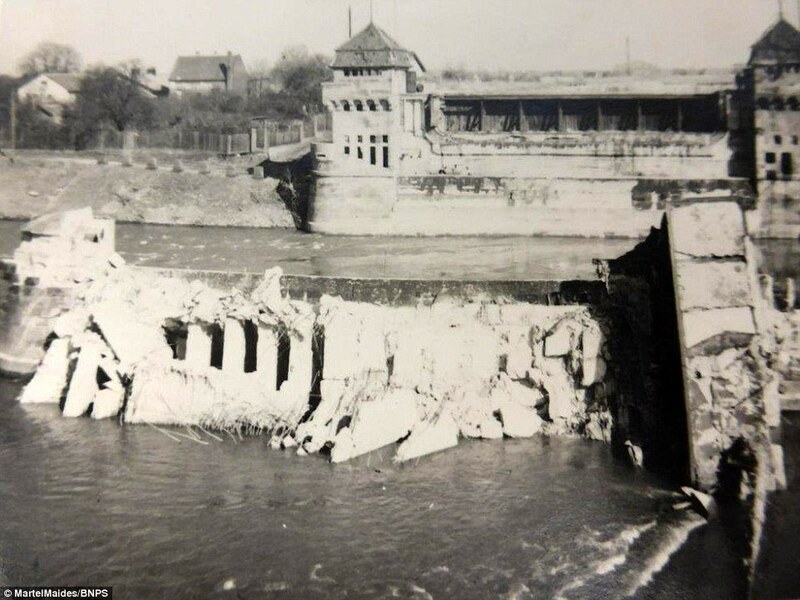 The incredible album of 262 black and white pictures show the stark aftermath of the war, with buildings reduced to rubble, towns flooded, bridges and dams destroyed and battleships sunk. Among them are intriguing and haunting images of an abandoned factory where the Germans made their deadly V-2 rockets. 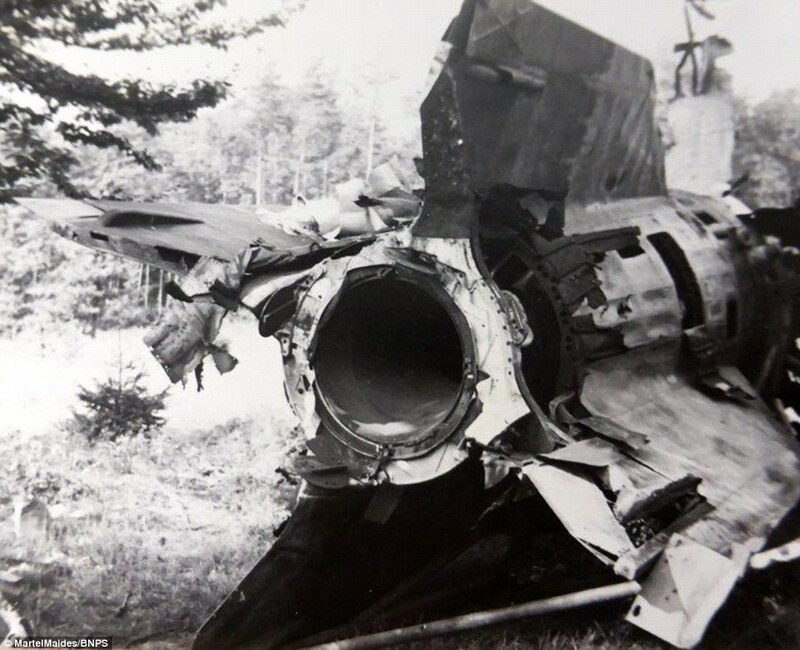 The V-2 was the world's first long-range guided ballistic missile, developed by the Germans as a 'vengeance weapon' to attack Britain in retaliation for the RAF's devastating bombings of cities like Dresden and Cologne. Unfortunately, not much is known about the photographer but they are believed to have been a British soldier who was with the Allied forces in occupied Germany in 1946. The album documents his travels through several regions of Germany, including Berlin, Minden, Bad Salzuflen, Bunde, Brunswick and Kiel Harbour, and also shows the efforts to rebuild the ravaged towns and cities. 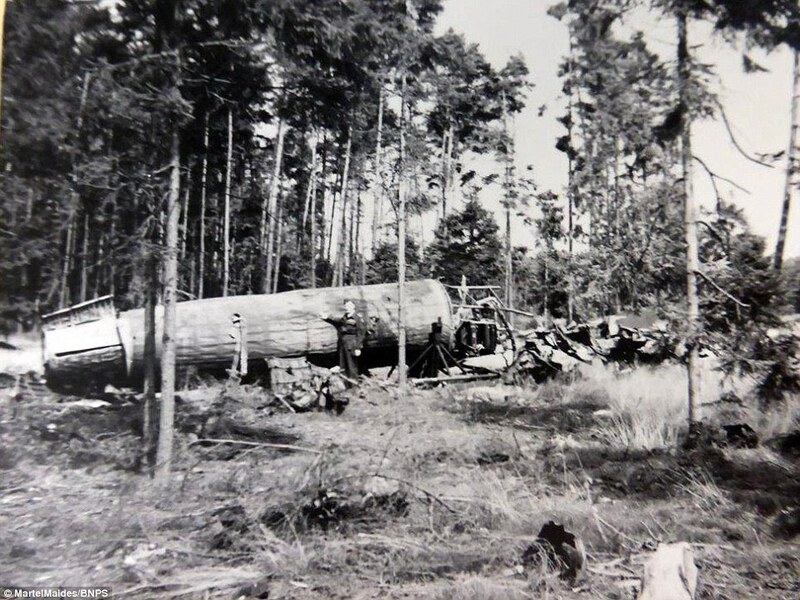 The V-2 rocket factory near Leese, near Hanover was discovered on April 8, 1945 by the Allies. 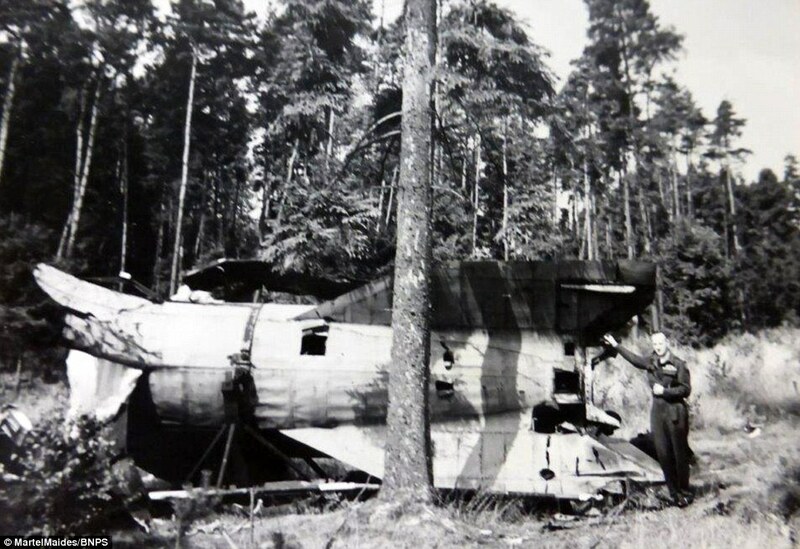 It is believed a retreating German battalion haphazardly destroyed the weapons and equipment with explosives before fleeing. 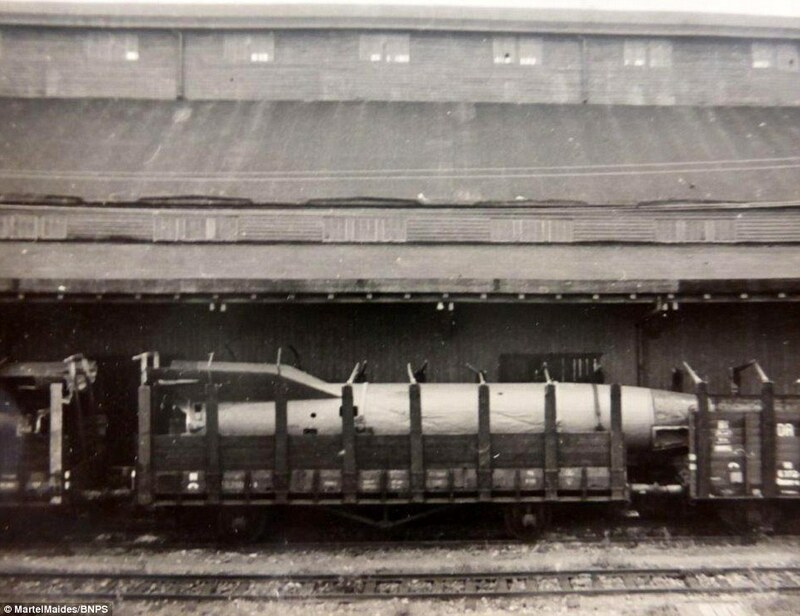 Hauntingly, one of the photos shows a rocket loaded onto a flatbed railcar, ready for transportation to a launch site. 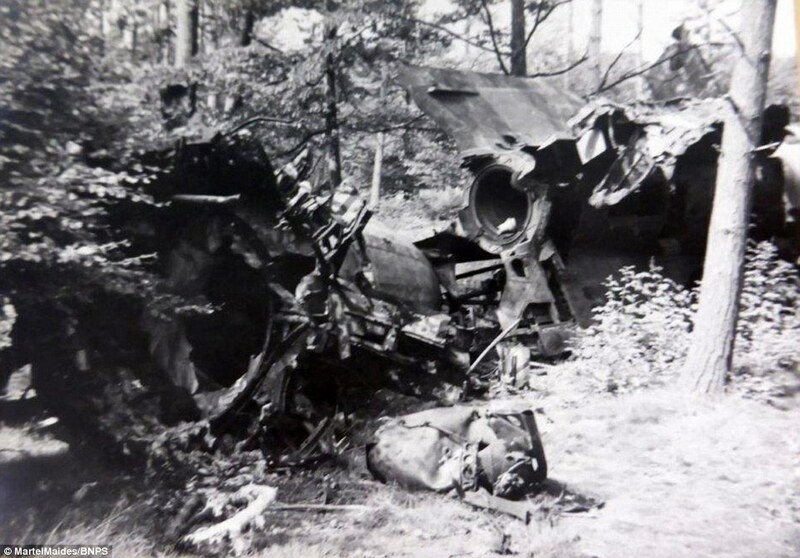 Another is of an unnamed soldier posing beside one of the huge damaged rockets like it is a tourist attraction. 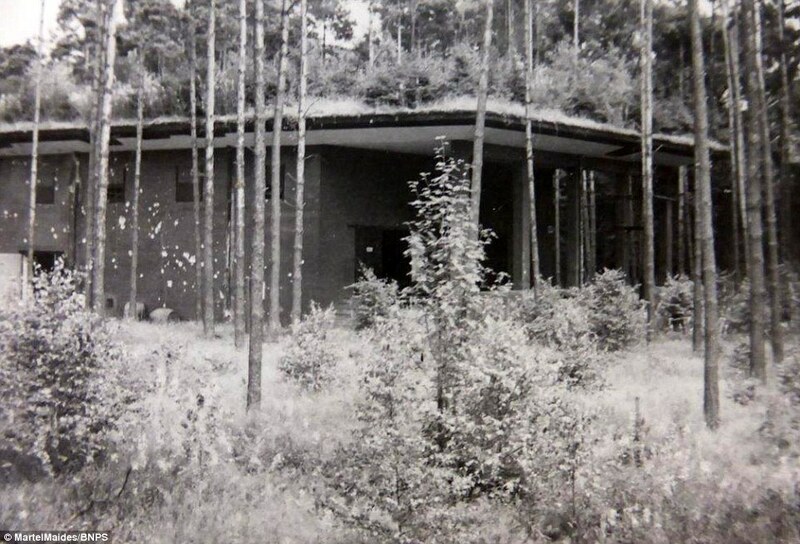 And the pictures of the factory, which is surrounded by trees, show it with a grass-covered roof to hide it from any air attacks. The album now belongs to an antiques dealer who has no links to the unidentified British soldier. The dealer is now selling it at auctioneers Martel Maides Auctions in Guernsey for an estimated £350. 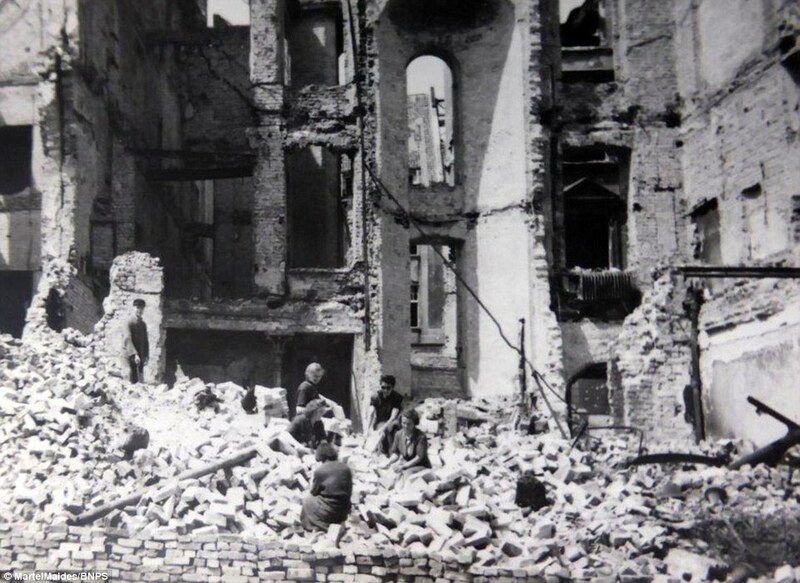 Justin Gibney, of Martel Maides, said: 'It is a wonderful documentation of post-war Germany. Some of the images showing the level of destruction to buildings and bridges is quite shocking. One set of photos that are captioned Minden residents thigh-high in flood water. 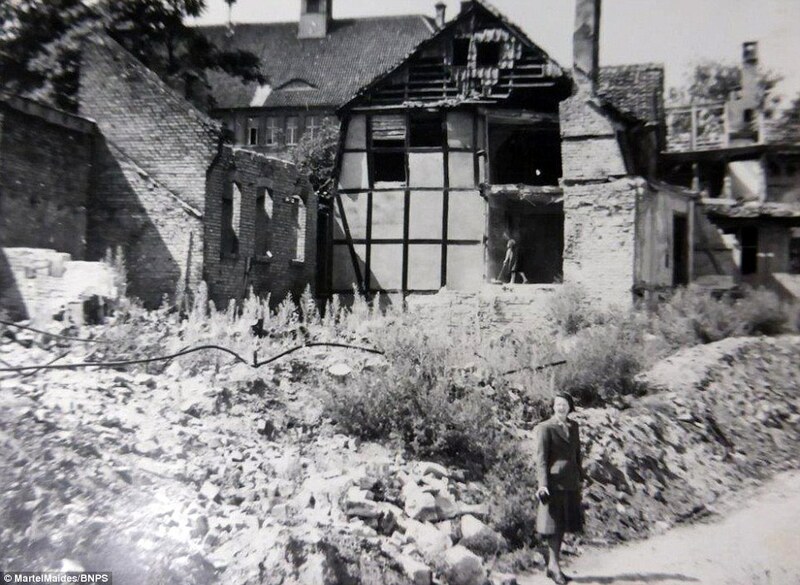 The town was heavily bombed during the war and sustained severe damage. 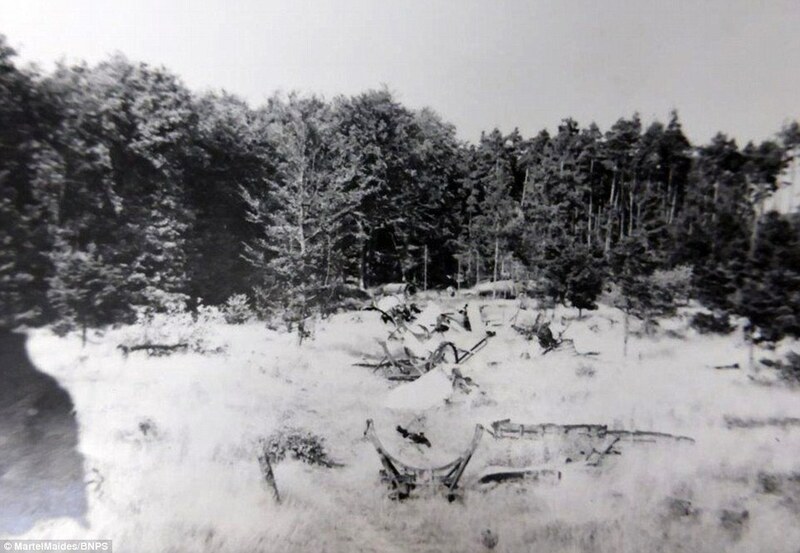 Underground factories for war materials were built in the Weser and Wiehen Hills near Minden and slave labourers from the nearby concentration camp were forced to produce weapons. 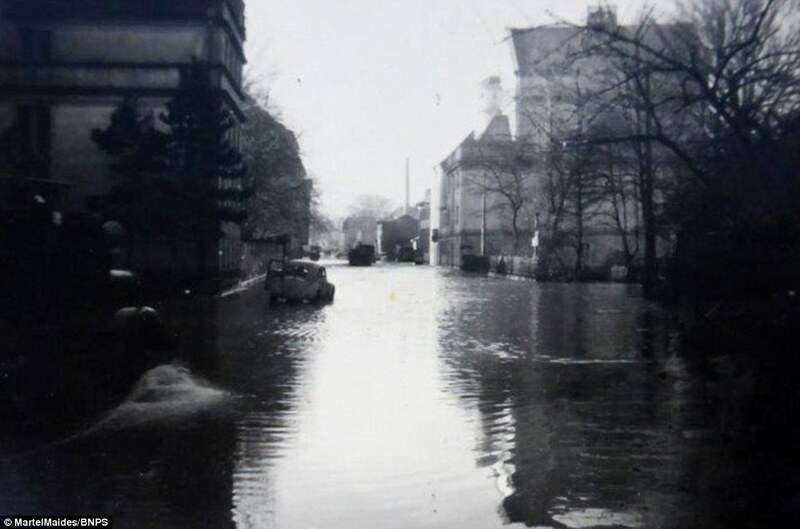 In a raid on October 26, 1944, the canal aqueduct was hit, breaching the Mittelland Canal and drowning workers in a nearby air raid shelter. 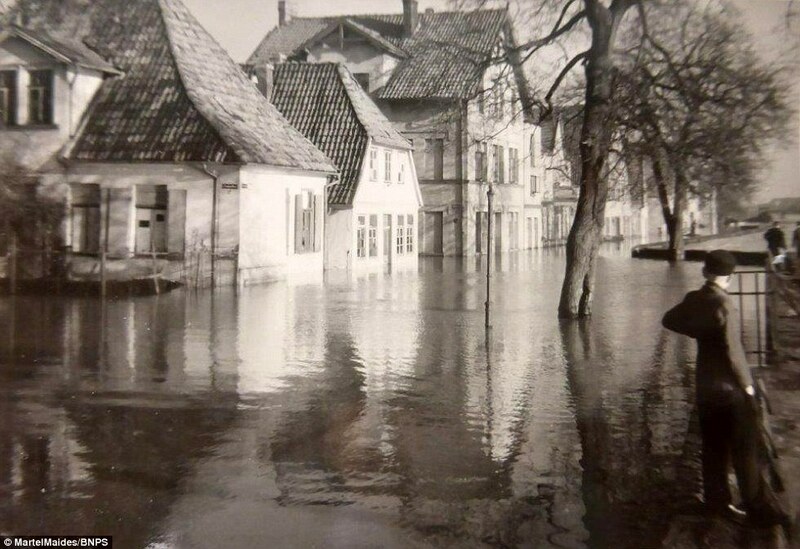 When the Nazis fled Minden they blew up almost all the bridges over the Weser and Mittelland Canal, as well as the aqueduct, in a futile attempt to delay the Allied advance, flooding the town again. 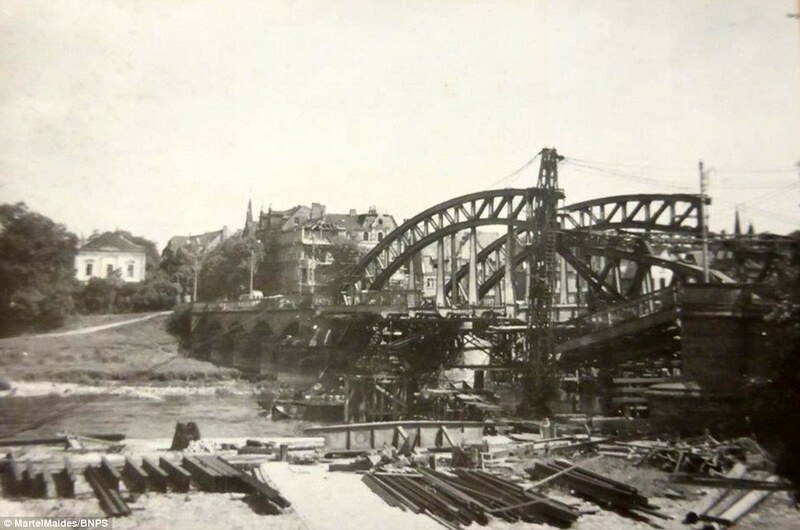 One picture in this album shows one of these bridges near Minden being rebuilt. 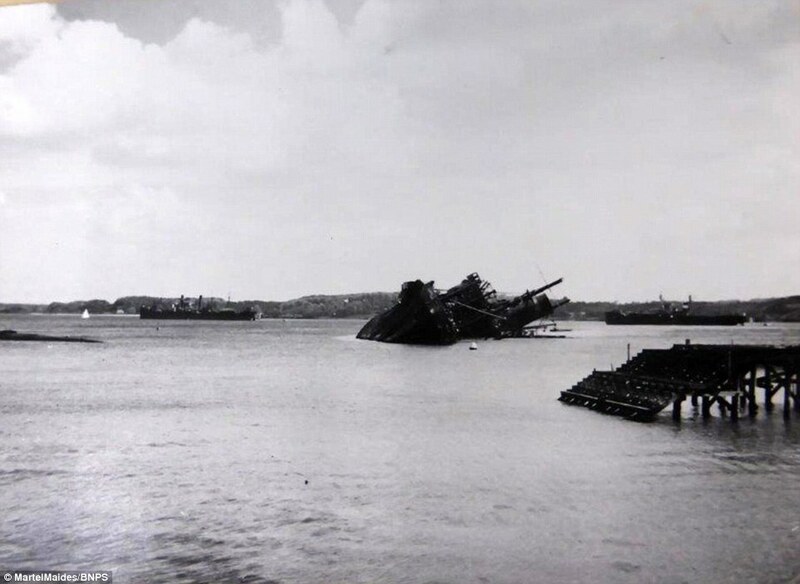 There are poignant pictures of Kiel Harbour, a major naval base during the war, with a partially sunken ship in the water, and the rubbled remains of the heavily bombed capital, Berlin. 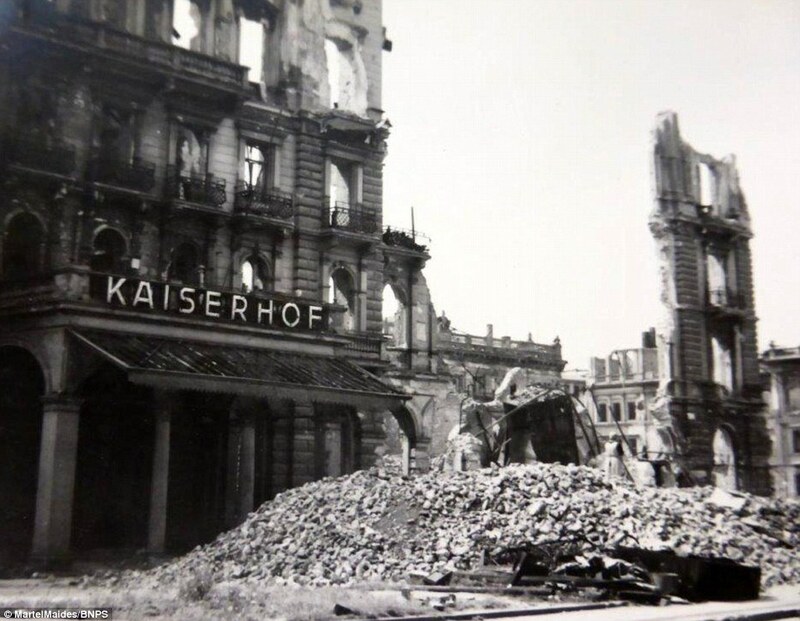 One shows a group of women sorting through the piles of bricks, presumably for ones to reuse to rebuild the city while another shows the ruins of Hotel Kaiserhof's, Berlin's first 'grand hotel' which was badly damaged by British bombers in an air raid in 1943. 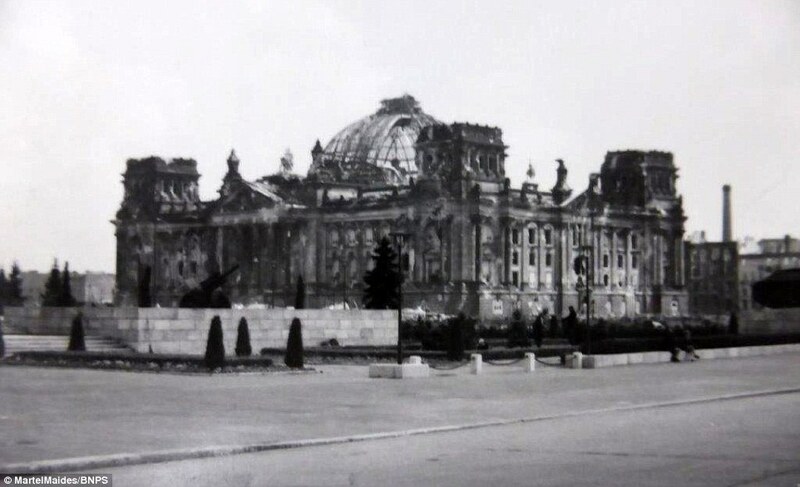 The damaged Reichstag building, where the German Parliament had met up until it was set on fire in 1933, is also in the album. 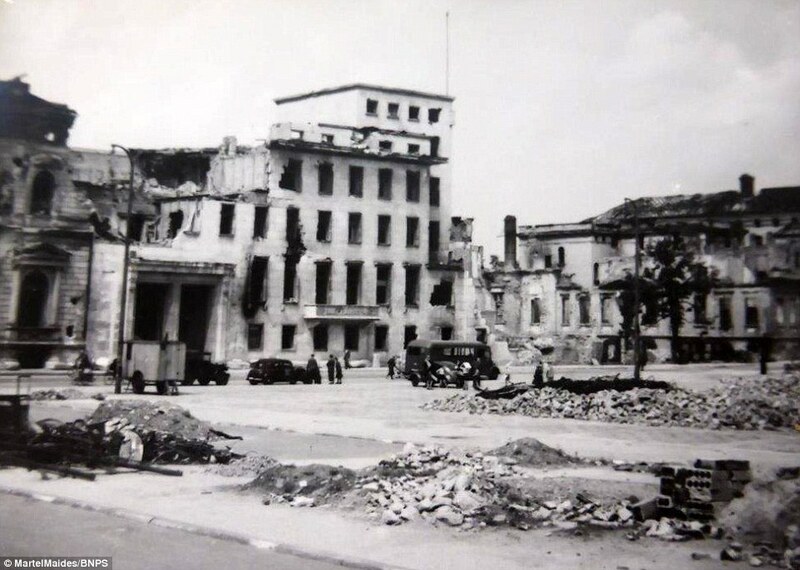 The building wasn't fully repaired while the Nazis ruled and was further damaged by air raids in the Second World War. It was partially refurbished in the 1960s but a full restoration wasn't completed until 1999, led by architect Norman Foster. The album is being sold on June 9.